To make sure you didn’t missed us too much, in our latest blog post we summarized all the YaST-related projects worked during Hack Week 15. But after all the fun, it was time for… more fun! So let’s take a look to what the team has delivered on this first sprint after Hack Week 15. One of the known limitations of the current installer is that it’s only able to automatically propose an encrypted schema if LVM is used. For historical reasons, if you want to encrypt your root and/or home partitions but not to use LVM, you would need to use the expert partitioner… and hope for the best from the bootloader proposal. But the new storage stack is here (well, almost here) to make all the old limitations vanish. With our testing ISO it’s already possible to set encryption with just one click for both partition-based and LVM-based proposals. 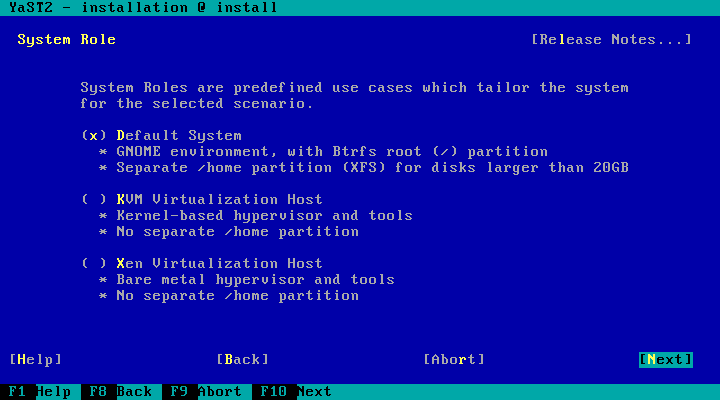 The best possible partition schema is correctly created and everything is encrypted as the user would expect. We even have continuous tests in our internal openQA instance for it. The part of the installer managing the bootloader installation is still not adapted, which means the resulting system would need some manual fixing of Grub before being able to boot… but that’s something for an upcoming sprint (likely the very next one). 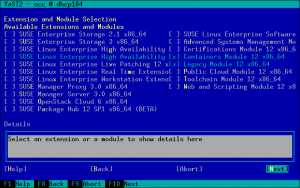 The dialog in SLES-12-SP1 for selecting the add-ons after registering the system was originally designed just for a small list of add-ons. Unfortunately (or fortunately, depending on how you look at it), the number of add-ons grew over the time and it exceeded the original limit for the text mode UI. 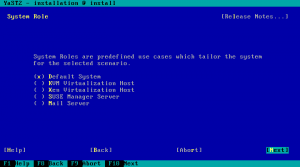 The equivalent screen in SLE-12-SP2 is not affected by the problem because it uses a different layout with scrollable list. 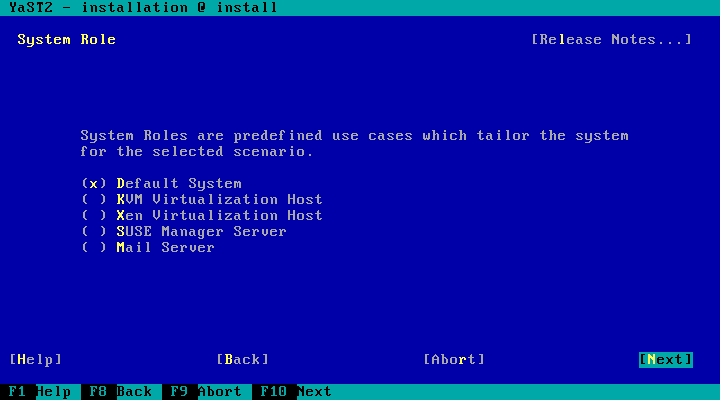 But the SP1 dialog looks like this. If you look carefully at the screenshot you will see that the Web and Scripting Module is missing in the list and the Back, Next and Abort buttons at the bottom are also not displayed. The fix decreased the size of the Details widget and allowed displaying more items in each column. Now there is even free space for three more add-ons. 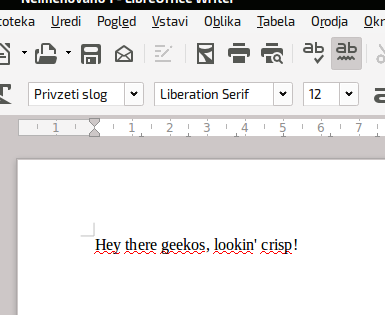 Moreover the dialog is now dynamic and checks the current size of the screen. If there is enough free space then the list is displayed in one column so the labels are not truncated and the Details widget size is increased back to the original size. The management of subvolumes is one of those features that make Btrfs rather unique and that need special handling when compared to more traditional file systems. 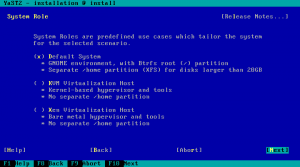 That was indeed one of the several reasons to rewrite libstorage – Btrfs subvolumes never fully fitted the philosophy and data structures on the old (current) libstorage and yast2-storage. In this sprint we introduced support for subvolumes in libstorage-ng from the ground up, taking into consideration all the specificities, use cases and scenarios found in the past. And, hopefully, in a way that is also prepared for whatever the future brings. The new functionality is already working and tested and it’s included in the latest versions of libstorage-ng, but is still not used in the proposal or any other part yast2-storage. You will have to wait another sprint to see more visible results. At least if “more visible” means screenshots. Meanwhile, if you like images you can always enjoy the graphs generated from the internal structures managed by libstorage-ng. 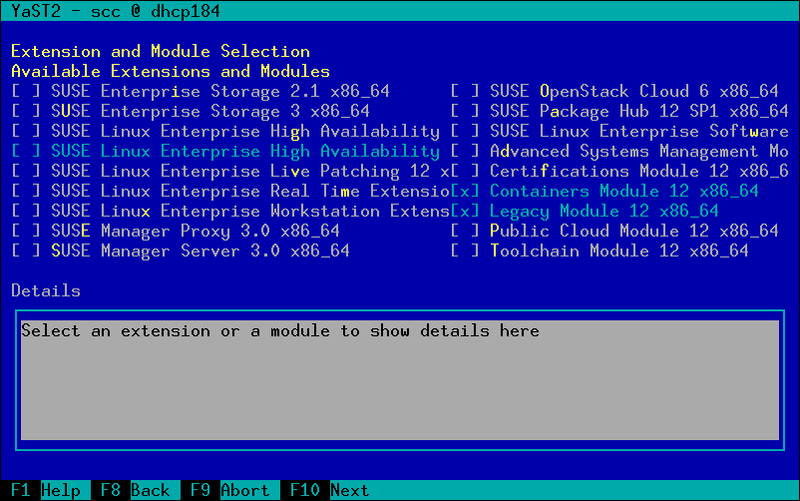 The new storage stack has been able to install an openSUSE system for quite some time already. While we keep improving that area, the next challenge was to make the upgrade from a previous openSUSE version also possible using our testing ISO. 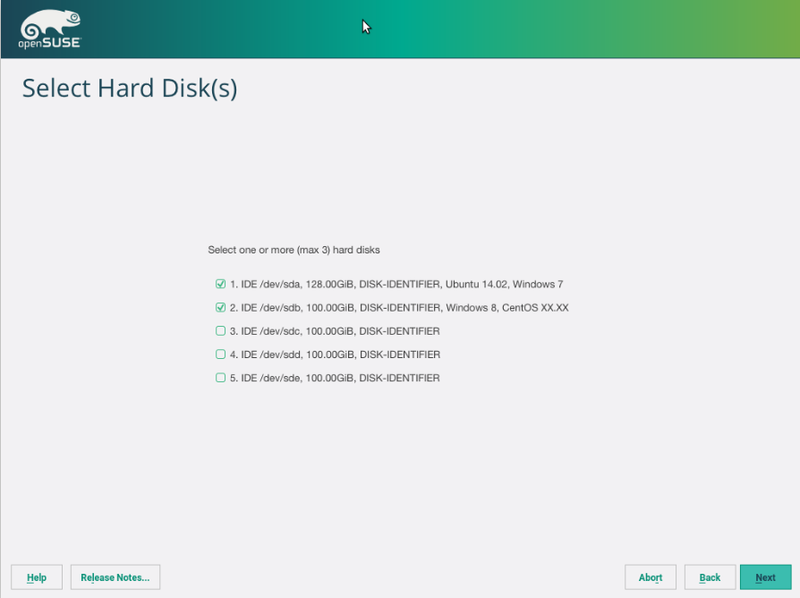 That implies scanning the hard disks looking for previous installations, allowing the user to select one, mounting the corresponding partitions or LVM volumes, performing the update of every package and doing some final tasks like updating the bootloader configuration. Following the iterative approach encouraged by Scrum, we focused in the first three steps, which is something that a user (or openQA, for that matter) can test and verify. So now we are able to detect and list pre-existing systems and start the upgrade process on the selected one. And we have automated tests in openQA to ensure it works across all the combinations of partition-based vs LVM-based layout and UUID-based vs name-based fstab file. 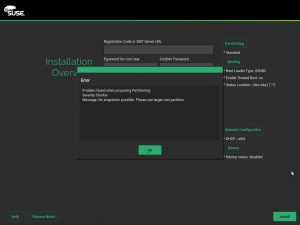 YaST is pretty customizable when it comes to adapt/modify the installation workflow. Among other things, add-ons are allowed to adapt the workflow (adding/removing steps), define new proposals, etc. 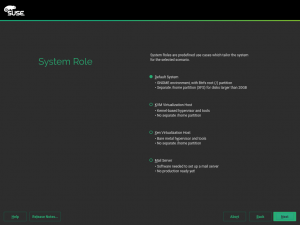 And starting now, they can also define new system roles. A really nice thing about YaST is that it’s able to run in textmode, so you don’t need a graphical interface to install or configure your system. As a consequence, YaST developers need to keep certain limitations in mind when working in the user interface. Now that add-ons can add new system roles, we noticed a potential problem in the dialog selection screen: we eventually will get out of space if more than one system role is added. 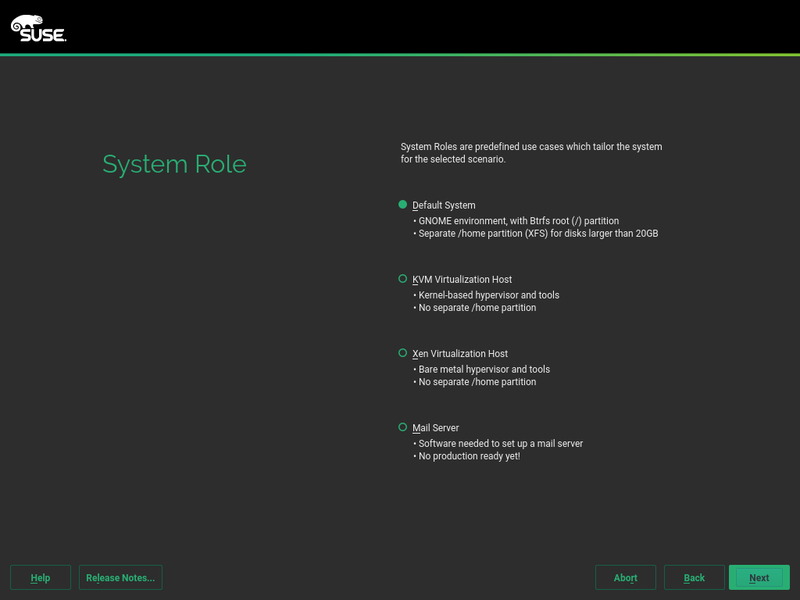 So we decided to improve how system roles are displayed to make them fit in a 80×25 mode (that is, only 25 lines of text). Let’s see the changes with some examples. This is how the screen looks by default, with a reasonably small set of roles. If the system detects there is no space to present all the information in such a convenient way, it removes all the spaces so at least the information is all there, even if it looks a little bit packed. If even that is not enough, the extra descriptions are omitted, which gives us way more room. If roles don’t fit even without the descriptions, the introductory text will be also omitted which means we can present up to eighteen (yes, 18!) roles in the screen. 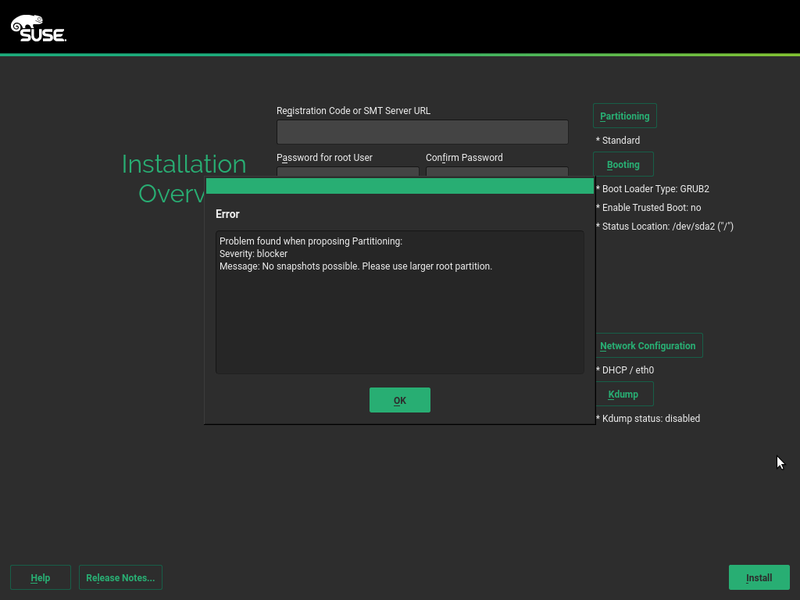 As explained in several previous reports, we are collaborating closely with SUSE UX experts to design the revamped interfaces of the installer’s partitioning proposal and the expert partitioner. We already showed you the document we used as a base to discuss the partitioning proposal, including the conclusions, and the first very simple prototype of the so-called Guided Setup. During this sprint, that collaborative effort focused on defining exactly how every step of that wizard should work and look like. The goal was to get some interface mock-ups to be used as starting point for the upcoming sprint. More than ever, a picture (well, four of them) is worth a thousand words. CaaSP is a single purpose system, and having snapshots enabled is essential. So there’s now a check in place that will simply prevent you from going on with the installation if snapshots are disabled (for example, if the disk is too small). For the new storage stack, we refactored the classes to handle /etc/fstab. While this would normally not be anything to write much about, we included intelligent handling for existing comments based on this standalone GitHub project. This means that existing comment blocks at the start and at the end of the file remain untouched, and comments before any content entry remain attached to that entry; i.e. when that entry is moved around in the file (e.g. because of mount dependencies), that comment is moving along with the entry it belongs to. While this is not 100% fool proof, it is much better than the usual strategy to simply discard such comments when the file is rewritten. 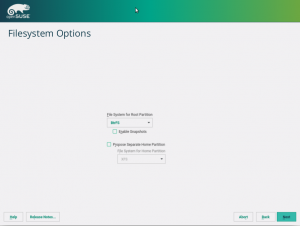 As you already know from previous reports and other sources, a considerable part of SUSE’s development firepower is focused on building the upcoming CaaSP. As part of that heavy development process, the YaST team invested a significant part of the sprint adapting YaST for CaaSP and fixing bugs introduced by previous adaptations. A large collection of changes here and there that are hard to summarize here but that help CaaSP to be a couple of steps closer to the final goal. We have already planned our next sprint which will hopefully bring more features to the new storage stack, CaaSP-related improvements, a surprise about AutoYaST and more stuff. And, of course, it will be followed by its corresponding report. So see you in three weeks. Stay tuned and have a lot of fun! Today: But what if I need a new kernel? A driver update (DUD) can of course update a single driver. But if that’s not enough and you need a whole new kernel to run an installation? We’ll need two tools for this (both available in Tumbleweed or here: mksusecd and mkdud). For this it’s important to know which kernel packages you’ll actually need. Typically it will be kernel-default and kernel-firmware. 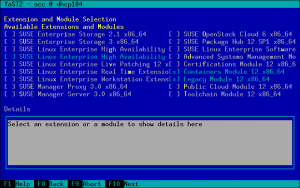 But older SUSE distributions (SLE 11 comes to mind) had the kernel packages split into kernel-default and kernel-default-base – you’ll need them both. To make things confusing, modern SUSE distributions also have kernel-default-base – but it’s an alternative to kernel-default. In this case we don’t need it. If unsure, check kernel-default. If it contains the actual kernel (e.g. /boot/vmlinuz) then you don’t need kernel-default-base. On some architectures modules are also taken from xen-kmp-default. If that’s important for you, you can add this package to the kernel list as well. In fact you can add any number of kernel packages or kmps you like. In the past, sometimes a different kernel flavor was used. For example PowerPC had kernel-ppc64 for a while. Simply use the flavor you need. Note that the --kernel option accepts a variable number of arguments, so you have to add an isolated -- to terminate the argument list properly. 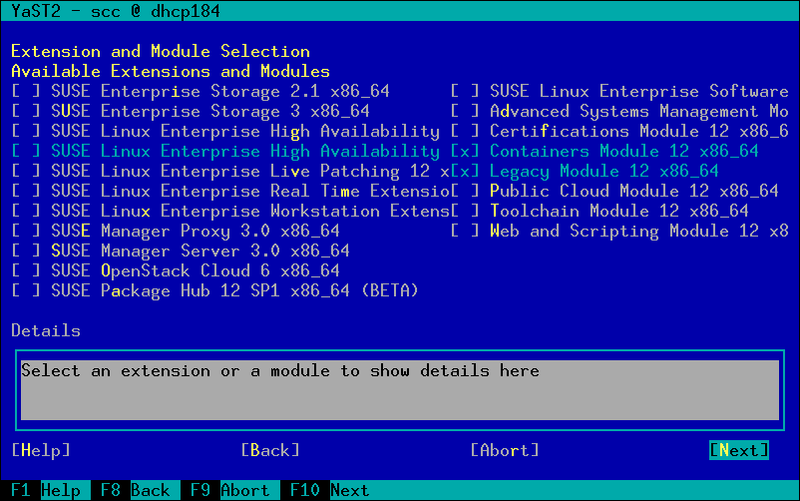 The command above will actually get the list of required modules from the old installation iso. If you are missing some driver or the new kernel comes with some additional driver, the module will not be added to the new iso. But there’s the --modules option. It will add the listed modules together with any implicitly required modules via module dependencies. As you can see, it automatically adds orinoco and cfg80211 as well. This creates a driver update for SLE 11 (which also applies to SP4) and the kernel rpms are installed via an auto-generated add-on repo (--install repo). Now we have the driver update that installs our kernel packages. But how do we use it? We integrate it into our iso above! mksusecd has an --initrd option that directly accepts driver updates and integrates them into the iso. 3. Can I have a choice? Maybe you just want to test this new kernel or sometimes need the old one and sometimes the new one. Can you make an installation iso that lets you choose the kernel? This does not replace the old kernel but adds a new boot entry Installation - 3.0.101-94. So you can install with old or the new kernel. Today: update the update process! Yesterday a colleague asked me if it would be possible to apply a driver update (DUD) to the rescue system. He wanted to use a new btrfsprogs package. My immediate reaction was: no, you can’t do it. But then, there’s no technical reason why it shouldn’t be possible – it actually nearly works. The updates are downloaded as usual – just not applied to the rescue system. linuxrc downloads the driver updates and stores them in an /update directory. One (numbered) subdirectory for each update. 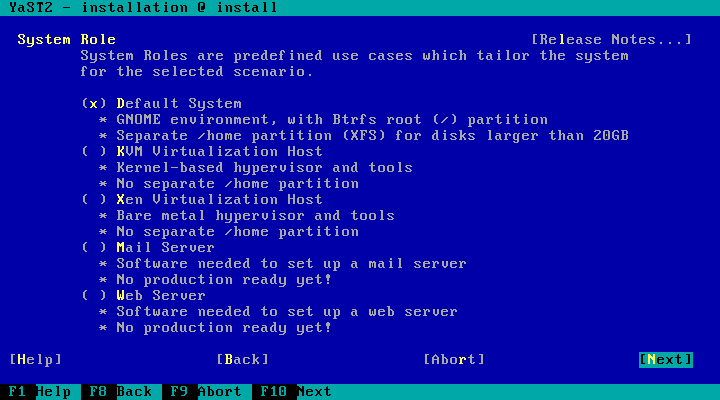 You have to know that prepare_rescue is run as the last thing before we exec to init. So everything is already in place, the left-over files from initrd are mounted at /mounts/initrd and will be removed at the end of the script. This means we have to copy our updates into the new root directory, else they will be lost. Also, we plan to make the adddir script available at /scripts/adddir by our driver update (see below). Here is the result: dud_for_rescue.dud. creates a driver update (for SLE12) that updates btrfsprogs also in the rescue system. This post it to document how we setup cloud.suse.de which is one of our many internal SUSE OpenStack Cloud deployments for use by R&D. In 2016-06 we started the deployment with SOC6 on 4 nodes. 1 controller and 3 compute nodes that also served for ceph (distributed storage) with their 2nd HDD. Since the nodes are from 2012 they only have 1gbit network and spinning disks. Thus ceph only delivers ~50 MB/s which is sufficient for many use cases. So we went with ovs+vxlan +dvr (open vSwitch + Virtual eXtensible LAN + Distributed Virtual Router) because that allows VMs to remain reachable even when the controller node reboots. But then I found that they cannot use DNS during that time, because distributed virtual DNS was not yet implemented. And ovs has some annoying bugs are hard to debug and fix. So I built ugly workarounds that mostly hide^Wsolve the problems from our users’ point of view. 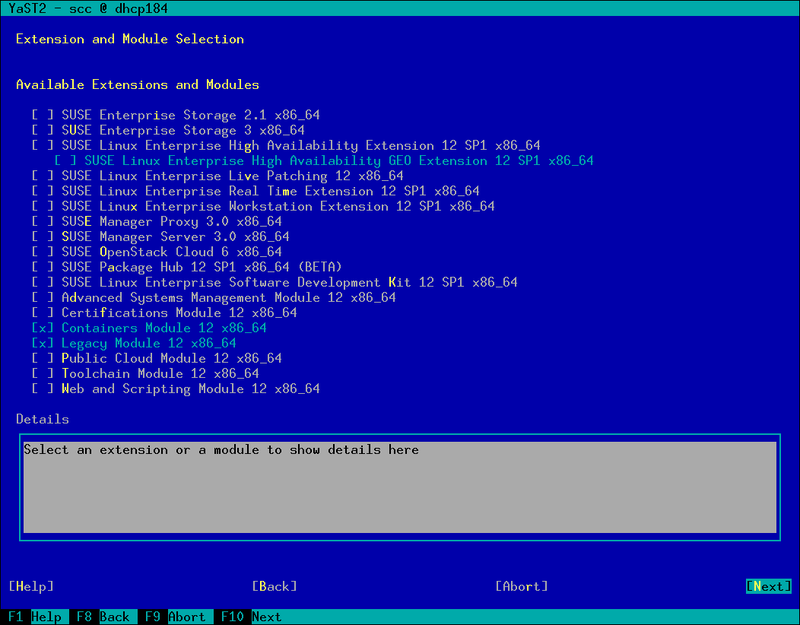 For the next cloud deployment, I will try to use linuxbridge+vlan or linuxbridge+vxlan mode. And the uptime is pretty good. But it could be better with proper monitoring. Because we needed to redeploy multiple times before we got all the details right and to document the setup, we scripted most of the deployment with qa_crowbarsetup (which is part of our CI) and extra files in https://github.com/SUSE-Cloud/automation/tree/production/scripts/productioncloud. The only part not in there are the passwords. We use proper SSL certs from our internal SUSE CA. For that we needed to install that root CA on all involved nodes. We use kvm, because it is the most advanced and stable of the supported hypervisors. Xen might be a possible 2nd choice. We use two custom kvm patches to fix nested virt on our G3 Opteron CPUs. Overall we use 3 vlans. One each for admin, public/floating, sdn/storage networks. For authentication, we use our internal R&D LDAP server, but since it does not have information about user’s groups, I wrote a perl script to pull that information from the Novell/innerweb LDAP server and export it as json for use by the hybrid_json assignment backend I wrote. In addition I wrote a cloud-stats.sh to email weekly reports about utilization of the cloud and another script to tell users about which instances they still have, but might have forgotten. to script instance setup and administration. Tools to create multi distribution bootable USB stick got couple of new improvements and features. live-usb-gui now offers choice of scripts to use, depending in your need you can either use live-fat-stick with vfat partitioned stick or live-grub-stick script which works with any partition format supported by grub2 including vfat, must be used if you have iso bigger than 4G. Recently we implemented Tally ERP 9 solution for Antico Pumps. 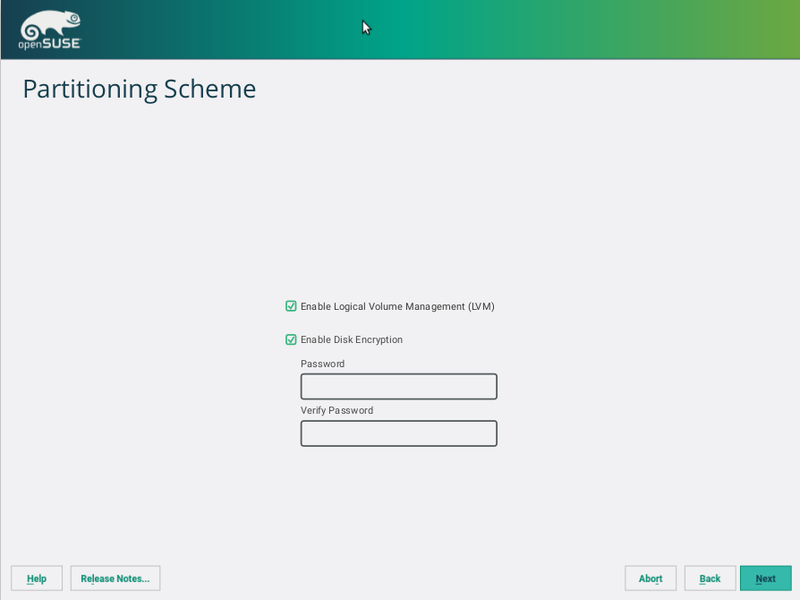 That itself is not interesting, the interesting part is they are using LTSP Fat client system on openSUSE. 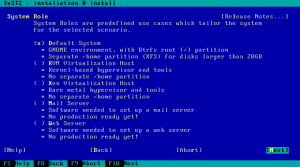 They have only one server from which all their client computers boot over the network, the clients do not have hard disk, client OS with all softwares they need including wine(Tally is Windows only software), as well as users’ data resides on the server. Once the client boots all the local resources are used so single low power server can be used to serve many clients. Tally multiuser is served from a Samba share on a NAS device, Tally folder is copied to samba share and path to Tally Data is changed so that it points there. Everything they need including printing and export(CSV) works from all clients. Same way Tally can be run on standalone computers. Neither Tally, Wine or openSUSE are modified for getting it working as it would under Windows environment.